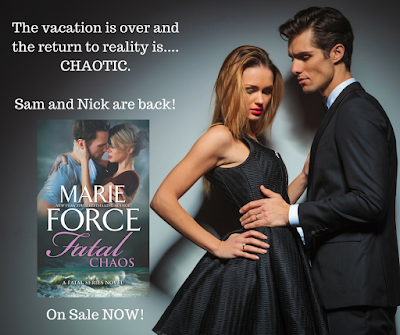 Today we are celebrating the release of FATAL CHAOS, a romantic thriller title that is part of the Fatal series by Marie Force. Teasers for the book, and the purchase links, can be found below. Escaping DC during the dog days of summer is one of the smartest moves Washington metro police lieutenant Samantha Holland ever made. Beach walks aren’t quite as romantic with the Secret Service in tow, but Sam and her husband, Vice President Nick Cappuano, cherish the chance to recharge and reconnect—especially with a scandal swirling around the administration. No sooner are they back home than a fatal drive-by shooting sets the city on edge. The teenage victim is barely older than Sam and Nick’s son, Scotty. As more deaths follow, Sam and her team play beat the clock to stop the ruthless killers. With Nick facing his greatest challenge—one that could drastically change all their lives and even end Sam’s career—will the mounting pressure deepen or damage their bond?